For as long as I can remember I’d always wanted to do karate. By age 6 or 7, my school friends and I had convinced ourselves we could do it however my first actual experience of the martial art was age 10 when my parents took me to a newly opened Goju Ryu club, a traditional Okinawa-style of karate. I took to the class immediately, but then I never had any doubts that I would. Classes ran for about a year before closing and the club’s other location was too far for me to travel. I tried a couple of other clubs but just didn’t take to them. During my late teens I found a Shotokan karate club. 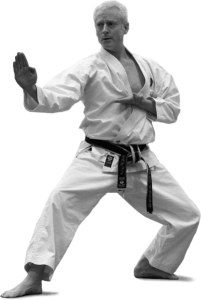 The Shotokan style is more comparable to other Japanese mainland martial arts with its big movements and dynamic structure. Unfortunately, this club too was open for about one year before closing down. I’d started work by this time, which I really enjoyed, so karate took a back seat while I focused on my career. A few years later, one Friday evening, I was standing outside a pub chatting to my friends and workmates when everything just seemed to stop. I found myself looking around at my senior colleagues who were in their mid-forties… their bellies in particular. I was at a crossroads and straight ahead was not where I wanted to be. I had recently taken up karate again at a small dojo very close to where I was living and all I could think about was the class that was due to start and the inspiring instructor who would be teaching. Although it was already too late to get to the lesson, I made my excuses and left. I have now been practising consistently for the last 20+ years and teaching karate is a real passion. I know everybody who comes to the club and invest my time wholeheartedly in their development. It is only now, after all these years, I understand that my time spent without karate, was a period of great emptiness. I was without direction and often found it hard to motivate myself. Practising karate helps to keep me balanced. The dojo is somewhere to switch off from work and all other day-to-day stresses one encounters in life, while enjoying the mental and physical benefits that karate has to offer. After training everything just seems better. Maybe, like me, you also feel like something is missing or that you would like to try a new activity? Perhaps you too can find what you are looking for in Karate. So if you find yourself at the door of the dojo thinking “I’m a beginner… everybody else looks like they know what they are doing…” or “I need to get myself fit before I try that…” don’t worry, just step inside. Everybody has been a beginner and your fitness levels will improve through regular training. There will never be a better time to start than now.